Wheel Vintique's Steel 63 Series O.E. Chrysler satin black wheels. Any other color Powder Coat for an additional charge. Factory outside knob style hubcaps applicable 8 3 4. Hubcaps & Trim Rings not included. Accessories that fit this wheel are 1011-A, 2050, 3001-A, 3001-15, 3002. Cragar was founded in 1930 but rose to prominence in the 1960s following the release of its now-legendary SS Super Sport wheels. Those wheels, and all Cragar wheels, continue to set the standard for muscle car rims. Using time-tested manufacturing and classic design, Cragar continues to produce quality wheels, wheel accessories, and brake rotors for everything from classic hot rods to high performance dragsters. American Legend's 1-Piece Classic Muscle Series Racer light gray wheels. American Legend's 1-Piece Classic Muscle Series Streeter polished wheels. 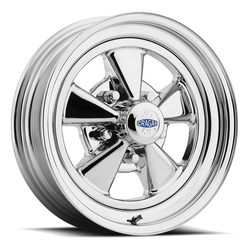 American Legend's 1-Piece Classic Muscle Series Racer polished wheels.